1- What are the new features added to Servlet 2.5? 2- Why do we need a constructor in a servlet if we use the init method? Even though there is an init method in a servlet which gets called to initialize it, a constructor is still required to instantiate the servlet. Even though you as the developer would never need to explicitly call the servlet's constructor, it is still being used by the container (the container still uses the constructor to create an instance of the servlet). Let us say in a plain java class, you created an init method that gets invoked under some condition, will you be able to invoke it without actually instantiating your class? That is why we need a constructor even for a Servlet. 3- When is the servlet loaded? 4- When is a Servlet unloaded? 5- What is the GenericServlet class? 6- Why is the HttpServlet class declared abstract? The HttpServlet class is declared abstract because the default implementations of the main service methods do nothing and must be overridden. Just like any other abstract class, the HttpServlet is a partial skeleton which defines basic behavior and then gives the programmer the freedom to implement any of the other possible features he/she wants. The simplest example here could be the fact that, any HttpServlet could handle multiple doXXX() methods as we call them which include doGet(), doPost() etc. So, in your applications, if you handle just the POST requests, then you need not implement a doGet() to override the default doGet() implementation. 7- Can a servlet have a constructor? Sure Yes. Though we don’t explicitly call the constructor using the new() operator, the container internally invokes the Servlet class’ container when the servlet is initialized. 8- Should I override the service() method while using the HttpServlet? We never override the service method, since the HTTP Servlets have already taken care of it. The default service method invokes the doXXX() method corresponding to the method of the HTTP request. For example, if the HTTP request method is GET, doGet() method is called by default. A servlet should override the doXXX() method for the HTTP methods that servlet supports. Because HTTP service method checks the request method and calls the appropriate handler method, it is not necessary to override the service method itself. Only override the appropriate doXXX() method. 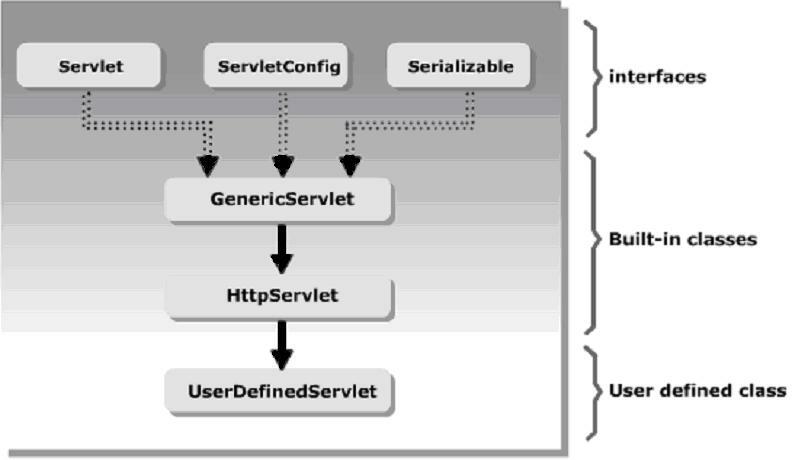 9- What are the differences between the ServletConfig interface and the ServletContext interface? It is one per our Servlet/JSP program. Servlet Config object means it is the object of Servlet container Supplied Java class implement javax.Servlet.ServletConfig interface. This object is used to pass additional data to Servlet and to read additional details from Servlet. This object is used to read Servlet init() parameter value of the web application. Servlet container create the object of Servlet config during instantiation and initialization. Servlet container destroys the Servlet config object during destruction process of our Servlet object. It is one per web application so it is called as the global memory of the web application. Servlet Context object means it is the object of java class implementing javax.Servlet.ServletContext interface. Servlet container create this object during during the deployement of web application. Servlet container destroy this object automatically when web application is undeployed or reloaded or Stopped. Using this object we can know the detail of underline Server like Server-name,version and Servlet api version. 10- What are the differences between forward() and sendRedirect() methods? c. The resource to which control is being forwarded has to be part of the same context as the one that is actually calling it whereas in case of redirect this is not a restriction. d. Forwards are faster than redirects. Redirects are slower because it is actually handling two browser requests in place of forward’s one. 11- What are the difference between the include() and forward() methods? 12- What is the use of the servlet wrapper classes? The HttpServletRequestWrapper and HttpServletResponseWrapper classes are designed to make it easy for developers to create custom implementations of the servlet request and response types. The classes are constructed with the standard HttpServletRequest and HttpServletResponse instances respectively and their default behavior is to pass all method calls directly to the underlying objects. 13- What is a deployment descriptor? A deployment descriptor is an XML document. It defines a component's deployment settings. It declares transaction attributes and security authorization for an enterprise bean. The information provided by a deployment descriptor is declarative and therefore it can be modified without changing the source code of a bean. The Java EE server reads the deployment descriptor at run time and acts upon the components accordingly. 14- What is the difference between the getRequestDispatcher(String path) method of javax.servlet.ServletRequest interface and javax.servlet.ServletContext interface? The getRequestDispatcher(String path) method of javax.servlet.ServletRequest interface accepts parameter the path to the resource to be included or forwarded to, which can be relative to the request of the calling servlet. If the path begins with a “/” it is interpreted as relative to the current context root, whereas, the getRequestDispatcher(String path) method of javax.servlet.ServletContext interface cannot accept relative paths. All path must start with a “/” and are interpreted as relative to current context root. 15- What is the < load-on-startup > element of the deployment descriptor? The element of a deployment descriptor is used to load a servlet file when the server starts instead of waiting for the first request. This setting by which a servlet is loaded even before it gets its first request is called pre-initialization of a servlet. It is also used to specify the order in which the files are to be loaded. The container will load the servlets in the order specified in this element. 16- What is servlet lazy loading? Lazy servlet loading means – the container does not initialize the servlets as soon as it starts up. Instead it initializes servlets when they receive their first ever request. This is the standard or default behavior. If you want the container to load your servlet at start-up then use pre-initialization using the load-on-startup element in the deployment descriptor. 17- What is Servlet Chaining? Servlet Chaining is a method where the output of one servlet is piped or passed onto a second servlet. The output of the second servlet could be passed on to a third servlet, and so on. The last servlet in the chain returns the output to the Web browser. 19- What are the functions of the Servlet container? Lifecycle management: It manages the life and death of a servlet, such as class loading, instantiation, initialization, service, and making servlet instances eligible for garbage collection. Communication support: It handles the communication between the servlet and the Web server. Multithreading support: It automatically creates a new thread for every servlet request received. When the Servlet service() method completes, the thread dies. Declarative security: It manages the security inside the XML deployment descriptor file. JSP support: The container is responsible for converting JSPs to servlets and for maintaining them.